Stephen Hawking says God’s not needed. So? Alan Boyle writes: British physicist Stephen Hawking’s [picture] latest book is already making waves with his observation that science can explain the universe’s origin without invoking God. "Because there is a law such as gravity, the universe can and will create itself from nothing," Hawking and his co-author, Caltech physicist Leonard Mlodinow, write in "The Grand Design," which is due to be issued next week. "Spontaneous creation is the reason there is something rather than nothing, why the universe exists, why we exist. It is not necessary to invoke God to light the blue touch paper and set the universe going." That’s the quote that lit the match in The Guardian as well in The Times of London, which published an excerpt from the book in its Thursday edition. But by itself, the quote doesn’t have much "there" there. If Hawking is saying merely that something can arise from nothing willy-nilly, that’s not much of an explanation for the origin of the universe. What he’s actually saying in the book is that when we study the universe’s origins, we have to work our way back from the present, rather than assuming there’s an arbitrary point 13.7 billion years ago when Someone pressed the button on a cosmic stopwatch. And when you look at it that way, the universe looks more and more like a quantum phenomenon, in which a multitude of histories diverge. This is what Hawking calls top-down cosmology. Gravity is part of the picture because it helps keep the cosmic balance sheet in line. Here’s the part of the paragraph just before the quote cited above: "Because gravity shapes space and time, it allows space-time to be locally stable but globally unstable. On the scale of the entire universe, the positive energy of the matter can be balanced by the negative gravitational energy, and so there is no restriction on the creation of whole universes." "The Grand Design" puts together ideas that Hawking has been trying out for a long time. Five years ago, for example, he noted that eliminating the question of what happened before the big bang meant "the beginning of the universe would be covered by science." And four years ago, he joked that he had presented a paper suggesting how the universe began during the same conference at which Pope John Paul II asked scientists to set the question aside. Does Hawking’s view mean that modern physics "leaves no place for God in the creation of the universe," as the Times suggests, or that "God did not create the universe," as The Guardian claims? Not unless you need a "God of the Gaps" to step into science’s place. A more sophisticated view would hold that physics (and evolutionary biology, to cite another example) are the not-always-mysterious ways in which God routinely works. In fact, Soren Kierkegaard would say that God’s workings have to be transparent — and I tend to side with Soren. Some will argue that such a concept of divinity is so weak it should be sliced away with Occam’s Razor. Others will quote chapter and verse to support their claim that religion trumps science. And still others will argue that science and religion should be non-overlapping magisteria. But hey . 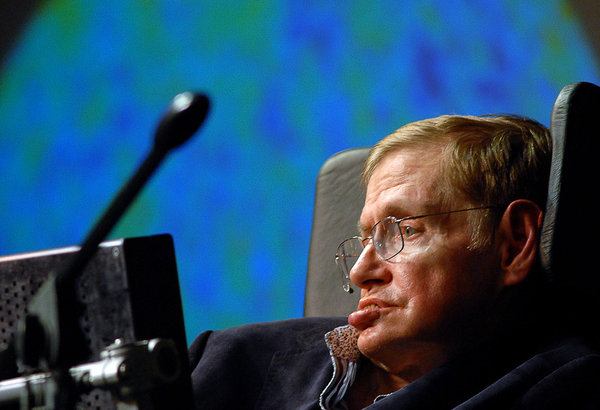 . . Read on and comment at Cosmic Log – Hawking says God’s not needed. So? 1 Response to Stephen Hawking says God’s not needed. So?